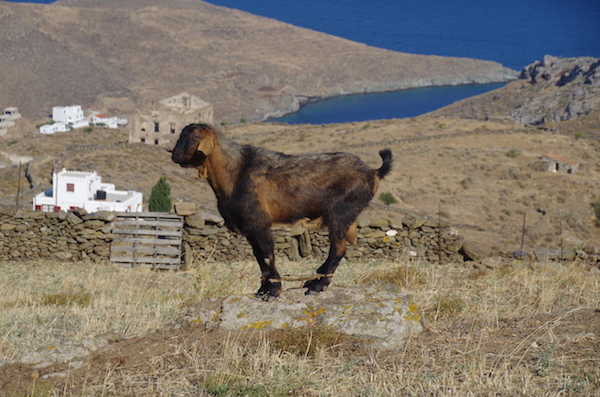 Young goat on a rock, Kythnos, 2018. THESSALONIKI Greece—(Weekly Hubris)—February 2019—During the early 1980s, my first years in Greece, I would seek out rooms on remote corners of islands, on or near the sea, stone houses with wells instead of running water, shepherds’ huts with candles and oil lamps instead of electric lights, fishing villages with locals instead of tourists. Living and working in Athens, I hungered for such escapes, simple abodes in barren landscapes, primitive, pristine and quiet, where I could strip my spirit down to bare essentials—and write. At first, wanting to see as much of Greece as I could, I’d go to a different island every summer or two, and would find the kind of sanctuary I was looking for fairly easily. After a few years, though, as tourism expanded and development became more pervasive, finding such places became harder and harder so, at some point, I began revisiting those earlier abodes, hoping to reexperience the enchantment I once felt there. A huge mistake. The first place I returned to was the seaside village of Anaxos on Mytilene, where I had stayed in 81 and 82. When I first went there, it had one dirt road, one phone in the one dry goods store, a lush valley of summer gardens and orchards stretching down to a long, deserted beach. 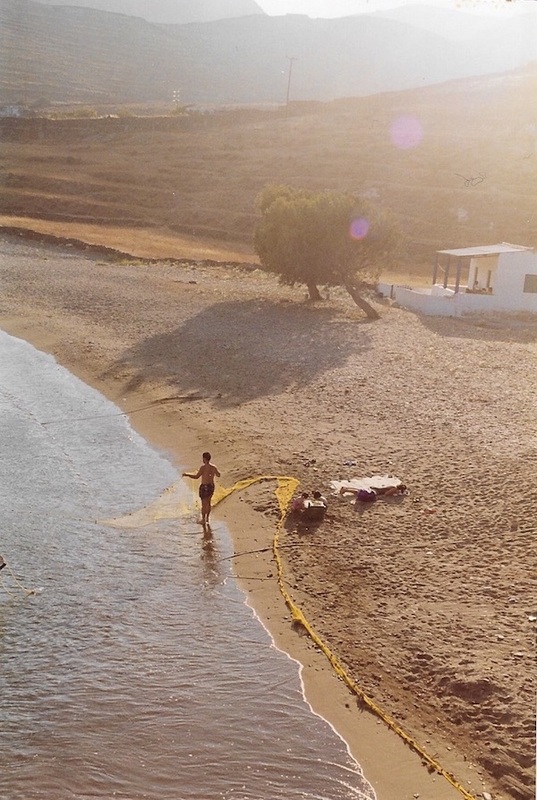 The only structure on the beach was a little fish-taverna tucked beneath some palm trees. Ten years later, the dirt road had been widened and completely paved over; it now ran down to and along the sea. Rows of shops and restaurants lined the busy road on either side. Instead of groves of pears and lemons, gardens with tomatoes and melons, dirt paths with goats and chickens, the valley was a glut of tourist hotels, pensions, and summer villas, one up against the other, some with swimming pools. Bars and clubs and at least a dozen tavernas abutted the road along the sea. The beach itself, barely visible beyond the mass of parked cars and bronzed pedestrians, had become a disheartening array of beach-beds and gaudy umbrellas—all good for the local economy but a nightmare for those of us who need nature, quiet, and solitude. 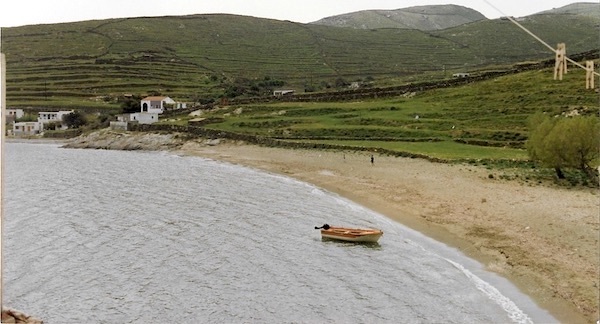 By the middle of the 1990s, I’d experienced that same disenchantment several times over, returning to once-remote, now overrun, overbuilt corners of Samos, Syros, Ithaca and elsewhere—so often that, when Georgios, the landlord of the last and most idyllic sanctuary I’d found in Greece, told me, with excitement and pride in his voice, that in the fall they’ll be putting in a road, it broke my heart. I swore, right then and there, that however much I loved that cove, I would never return. And for 23 years I didn’t. I couldn’t. Let me introduce you to the bay that had so enchanted me, that place I felt certain back then I was losing . . . .
rise from the sea, pocked, scaled with salt. Clumps of earth where nettles root. trilling in one tall cypress. paws at a fig beyond her reach. glowing in the moon. No one’s here. 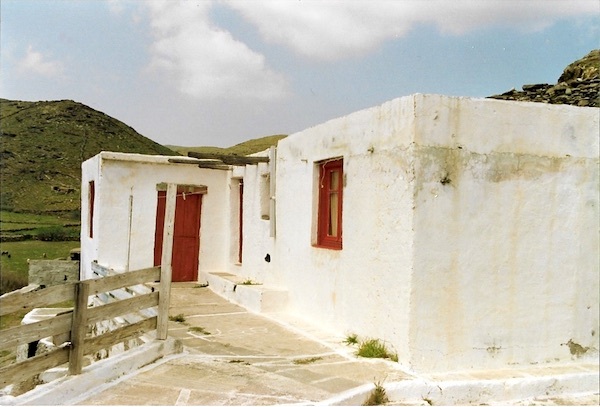 The Cyclops House, Naoussa, 1993. We parked above a small bay, then walked 40 minutes or so along the water to the third cove over. The house he showed me, almost apologetically, was wedged into the far edge of the bay, a somewhat rickety structure of stucco over stone and brick, built on an outcrop of rock rising up out of the sea. The rock, in fact, was one wall of the house. It was exactly what I was looking for—a simple dwelling with a well instead of running water, candles and oil lamps instead of electric lights, a settlement with locals instead of tourists. The kitchen had hooks drilled into the rock to hang utensils, curtains draped over wooden shelves for cupboards, no fridge (I kept things cool by hanging them in the well), a propane stove, a big marble sink and a long counter for cutting up all the veggies and fruit I’d be eating that coming summer. To the left of the kitchen was an open space, not quite a living room, lit from two sides by traditional, deep-silled, timber-framed windows. There was a divan in one corner, a taverna chair and table in the other (what would become my desk, indoors and out). Off a small hall to the right there was a surprisingly big bedroom, again with two deep-silled windows. The most surprising feature of all, and to me one of the most memorable, was the ceiling, made of woven bamboo (under concrete), supported by rafters made of old telephone poles (Georgios worked for the phone company), rough-hewn logs painted deep blue. The other feature I came to love was the big veranda, twice as wide as the house, leaning toward the sea. The beach was five steps below my porch-gate, the closest neighbor a football field away. All the other residents lived in small houses clustered on the other side of the bay. Perfect. In the three whole summers and two Easters I wound up staying there, I came to love sitting on that veranda, looking up now and then from my taverna table to study the sea and capture in words the many mesmerizing shifts and swells on the water’s surface and feel the deeper currents in its shimmering depths. At night, I would lie on my straw mat, gazing up at the constellations and planets and passing planes, all so bright I could almost reach up and pluck them right out of the sky. If this was indeed Polyphemos’ house, he was one lucky Cyclops, though in the loneliness, quiet and solitude of “his” space, I imagined a different sort of life for him…. scattered ash and bone, for her to find. 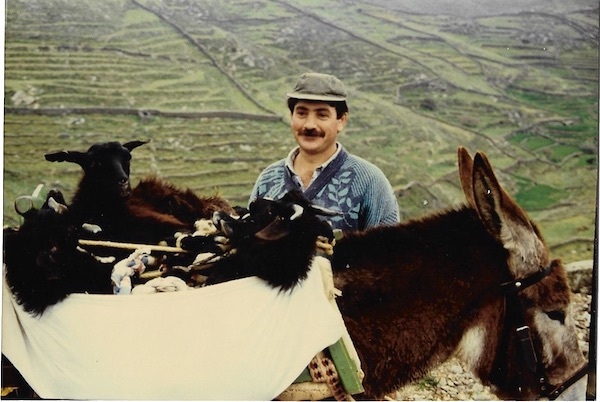 Local resident transporting lambs on his donkey, Kythnos, 1994. During the summers I stayed in the Cyclops House, the locals treated me with kindness and curiosity but kept their distance. The men were busy fishing, looking after their animals, orchards and fields; the women tending their vegetable gardens, feeding their chickens and gathering eggs, milking goats and making cheese. It was summer, so the pace of life was slow. They all seemed to keep watch over the ksenos (stranger) on the other side of the bay. And in turn, when I made the hourlong hike up to Dryopida, the nearest village, once a week or so, I’d always bring back enough fresh bread for several others. 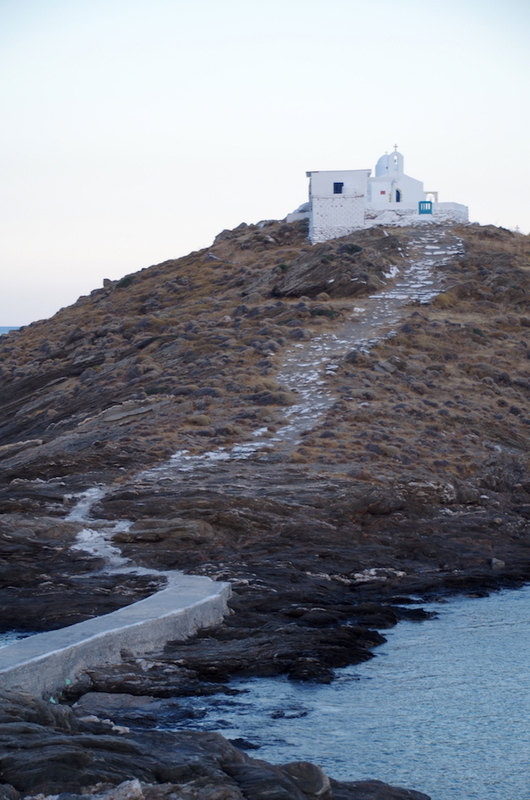 Locals had to pass just below my house in order visit the nearby chapel, Aghios Eleimonas, perched on an islet a few minutes’ walk away, accessible by a narrow, cement footbridge. If they saw me sitting on my veranda, my neighbors would wave and ask me how I am, then keep on walking up the path. One day, six men carrying bags of quicklime and long-handled brushes called out greetings as they passed. The chapel’s feast day was approaching, and, even though there was a strong wind, they were going to paint the chapel and the area around it, spruce it all up for the festival the following day. Knowing that my neighbor had a long-handled brush hanging in a corner of his shed, I quickly ran and borrowed it and then chased after the men, hoping they’d let me help. job well done . . . .
they set to work on the outside wall of the porch. bricks in rows, globs of mortar. speak my message from the divine. or its end . . . .
maybe a word or two. 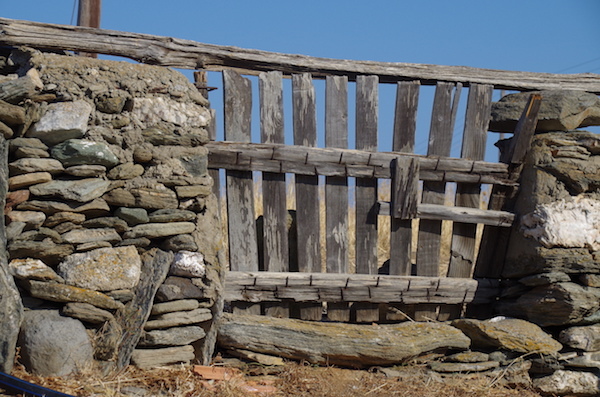 Wooden gate at the far end of the cove, Naoussa, 2018. This last summer, 23 years after I was last on Kythnos, I finally got the courage to return. During the two-hour ferry ride from the mainland, images of noisy bars and discos kept crowding my head, garish umbrellas and rows of jet skis cluttering up the beach on my lost cove. High-rise hotels with swimming pools where fields of barley and drystone walls once were, dapa-doupa music drowning out the sound of lapping waves. Half the mountain blasted away where the Cyclops House once stood, and, in its place, kitschy bungalows or a massive condominium. Still hesitant to see that dystopian possibility, my companion and I decided to stay on a different part of the island. Finally, after several days of procrastinating, we drove to Naoussa. The first positive sign was that the road (not so new by now) didn’t go all the way down to the beach, but ended at a parking lot well above the sea. True, next to the parking lot there were two large bungalows with several tourist units but, as we walked down toward the water, to my delight, most of the houses on the other side of the cove were still there, just as they had been in my time. Descending the steps carved into the rock that divided the cove into two (a detail I had completely forgotten), I could see that the beach was just as I remembered it—a wide swath of coarse sand, with a few bathers lying on their towels and straw mats spread out under the scattered tamarisks. The small house that belonged to my closest neighbor was still there, as was the drystone wall that protected the well. And, in the rock at the far edge of the cove . . . the Cyclops House! . . . not exactly as it was but, still, the same basic structure, with the same character. Once down on the beach, I could see that the other side of the cove had more houses than before, with a road running above the newer ones higher up. But on “my” side of the cove, little had changed. We walked across the sand, laid out our straw mat and sat there for a long while. Clearly, the Cyclops House had been done over. There was a solid fence of wood and stone below it, and the veranda had ample shade from a sturdy straw awning. The dwelling itself had been expanded on both sides, with relatively fresh paint on the walls and shutters. But it still was a simple, pristine island house. Though I calmly pointed out these details to my companion, inside, my heart was leaping with joy. Seeing some movement on the veranda, I boldly walked up to the gate, introduced myself, and asked if I could talk to them for a few minutes. An older couple, sitting at a table (much bigger than any I had ever had), invited me to come up to the veranda and have coffee and ice cream with them. The current owners of the house, as it turned out, they bought the property from Georgios the summer I stopped coming to the island. Like me, they loved the house so, over time had renovated it to make it comfortable for themselves and their two children. They were kind enough to let me take a look inside. The blue rafters were gone, and the rock face was no longer the far wall. Of course, the house now had electricity and running water, as well as two additional bedrooms, one added to the left side of the structure and one as a loft above the rear of the original. (They had cut away some of the rock to extend the kitchen and make room for that loft and a bathroom.) But the wide windows with timber frames were still there. All the accouterments were traditional—plain embroidered curtains on the windows, wooden shutters, coarse pine cupboards in the kitchen. It was still the Cyclops House. It still felt that way. 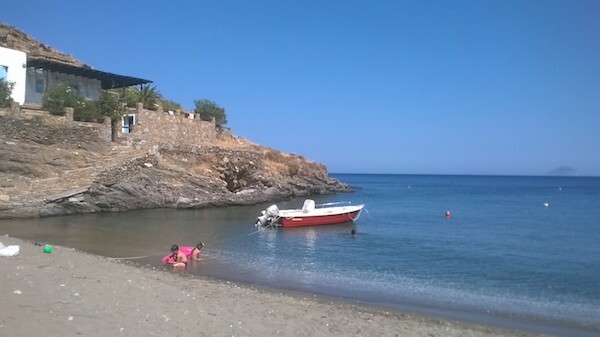 Beach below the Cyclops House, 2018. My companion and I wound up going back to Naoussa several times during our three weeks on the island. I didn’t visit the new owners a second time, but we enjoyed the beach and the sea below the Cyclops House, much as I had those many years before. And we went to other coves and bays nearby, the ones I had got to know so well two decades earlier. Some also remained little changed. A few, alas, had given themselves over to tourism. 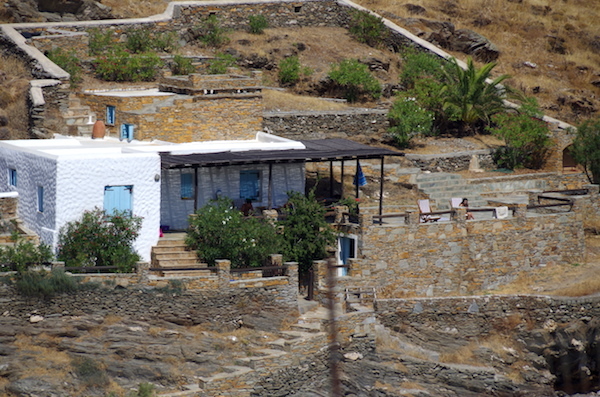 It turns out that the people of Kythnos, by and large, appreciate simplicity and tradition, just as I do. Though locals welcome (and need) tourism, they still enjoy lives outside of that industry, and pride themselves on keeping much of their island as it has always been. Of course, there are places with jet skis and bars, eyesore hotels and late-night carousers. The main village, Hora, for example, which once didn’t even let visitors rent rooms there, has now completely transformed its main streets into a bustling haven for vacationers. But most of the landscape remains bedecked with stepped slopes and drystone walls, its open spaces mainly used for grazing goats and sheep and growing barley. As for me, I know I’ll probably never again find on Kythnos the solitude and quiet I experienced there in the mid-90s; never descend in my imagination to the bottom of that bay; never carry a rattling brush and share wine with my neighbors whitewashing their chapel or find squid one of them has left on my doorstep; never feel my spirit stripped so completely bare by the intense presence of landscape, sea, and sky that I, myself, have become an absence. Nevertheless, instead of being overwhelmed by disenchantment, as had happened so many times before, in returning to Kythnos I experienced, for the very first time, what some might call “re-enchantment.” Now I can’t wait to go back. Beach below the Cyclops House, 1995. 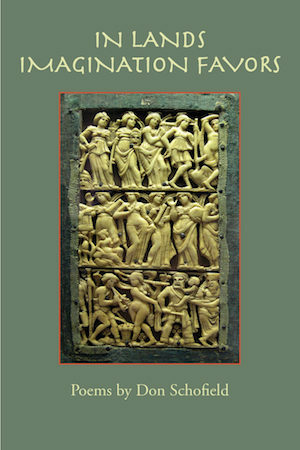 Author’s Note: “Cove,” Polyphemos on His Veranda” and “My Neighbor’s Brush” appear in Approximately Paradise (University Press of Florida, 2002). All photos by the author. 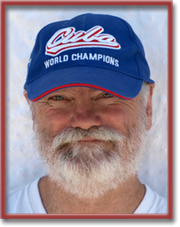 Born in Nevada and brought up in California, Don Schofield left America in 1980. Since that time, he has been living and writing in Greece, traveling extensively, teaching, and serving as an administrator at various universities—Greek, American, and British. 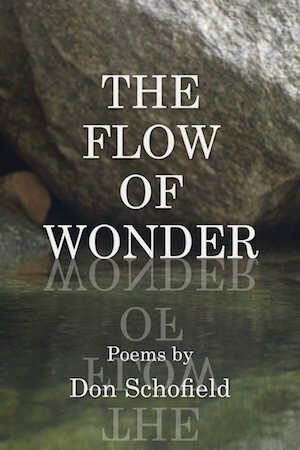 Fluent in Greek, a citizen of both his homeland and his adopted country (or, more precisely, the country that adopted him), he has published several poetry collections as well as an anthology of American poets in Greece and translations of contemporary Greek poets. He has been awarded the Allen Ginsberg Award (US), the John D. Criticos Prize (UK), and a Stanley J. Seeger Writer-in-Residence fellowship at Princeton University. His first book, Approximately Paradise, was a finalist for the Walt Whitman Award, and his translations have been nominated for a Pushcart Prize and the Greek National Translation Award. Recently retired, he and his companion live in both Athens and Thessaloniki. Fine job. I like remote places, too, though I have never gone to any. Glad you liked the piece, Bill. One day, for sure, you will. But as I suggest in my article, the real difficulty is going back. Don, you were given a great gift to be there in Greece in those days – I have memories from the island of Skyros that are similar from 1974, living in a widow’s little hut with an outdoor sink and oil lamps. Your writing brings the essence so well, and the photos too.